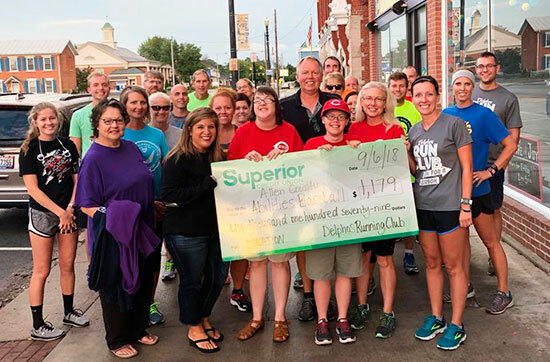 DELPHOS — The Delphos Running Club will start its sixth year on Thursday with just under $45,000 donated to local and area non-profits in the past five years. The club was started by Mandy Weimerskirch as way to meet up with friends, get some exercise and socialize afterward. The avid runner got the idea when she and her husband visited friends in Florida. Membership in the club is easy — just show up and someone will win the $25 gift card given each week. After a participant finishes their fifth event, they receive a free T-shirt. The club meets for registration at 7:15 p.m. at The Rustic Cafe on Thursdays and the 5K run starts at 7:30 p.m. Walkers, joggers and runners are welcome. The event is not timed but through generous donations of local businesses, lucky participants can win door prizes like gas cards. Whatever runners decide to give at registration benefits a local organization. April's supported organization is Night to Shine; May — Little League Association; June — Equestrian Therapy; July — Meals 'til Monday; August, P.A.S.S." and September — Delphos Senior Citizens. Last year’s non-profits were Rock for the Heart, SHYAA, the Matt Ulrich Foundation, Make It Enough, Ronald McDonald House Charities, Allen County Abilities Baseball League, the Give Back Program and Meals ‘Til Monday. Weimerskirch and the committee have also added some new incentives. Those who complete their 1o run/walk will receive a stainless steel, screw top water bottle with the club logo engraved on it; the 15th time some participates this year they will receive a quarter-zip club jacket; and the top 10 participants will go into a drawing for an Apple watch. The new awards were make possible by money from the Rustic Cafe from the Brown’s Backers Golf Outing, the Berelsman family and Vancrest of Delphos. Weimerskirch hopes to see some new faces along with the regulars. Participants come from all over the area, including Lima, Spencerville, Van Wert, Ottoville and Fort Jennings. Weather is a factor for the runs. Weimerskirch said as long as there is no lightning and the temperature is in high 30s to the low 40s, the race is on.